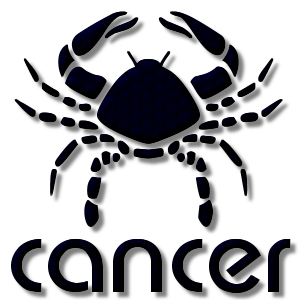 Add a Cancer The Crab Zodiac stampette to your Facebook and Twitter profile images and show your star sign. In Greek mythology the crab was placed in the sky by the goddess Hera. Hera had tried to murder Heracles, the famous Greek hero, but was thwarted by his incredible powerful strength. Hera then cast a spell on Heracles, causing him to turn insane and commit crime. In order to be forgiven he had to perform twelve tasks, one of which was to destroy the water serpent, Hydra. Whilst fighting against Hydra, the goddess Hera sent the crab to aid Hydra against Heracles. Heracles used his mighty strength to kill the crab by smashing its shell using his foot, he then ate the crab in a stew. As a reward for its services however, Hera still placed the image of the crab into the sky.